Whether you are studying English as a foreigner or preparing for a test, you need a dictionary or thesaurus. Carrying expensive books is not fun. 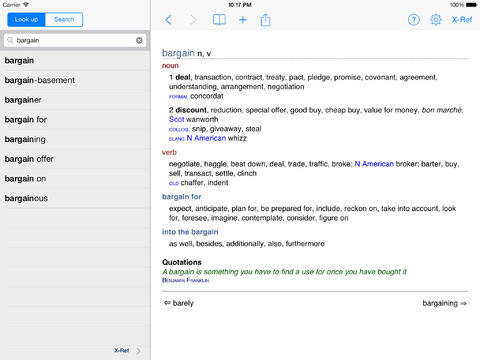 Chambers Thesaurus for iPad happens to be a beautiful application that helps you look up synonyms and antonyms fast. It has over 40k words and about 400k synonyms and antonyms. Chambers Thesaurus not only helps you look up words fast but it also provides you with examples and other information you need to learn new words faster. It even offers spelling suggestions. If you have the Chambers Dictionary, you will be able to cross reference it using the X-ref feature. You don’t need an Internet connection to use this app. You can bookmark and keep track of recent words . Chambers Thesaurus is fast and easy to use. It not only helps you look up words but also keeps track of the ones you are learning. It sets you back under $5 at the time of this writing.